If you'd like to book a Consultation, or look at Consultancy options, please scroll down. If you'd like to read a bit about what I offer, and my background, carry on reading...! In August 2012 I completed the School of Babywearing Consultancy Training and in January 2015 the Slingababy Consultancy Training. These two, very different training courses covered the physiological side of carrying, as well as the practical aspects, giving me a well-rounded knowledge of carrying in many different situations and circumstances. 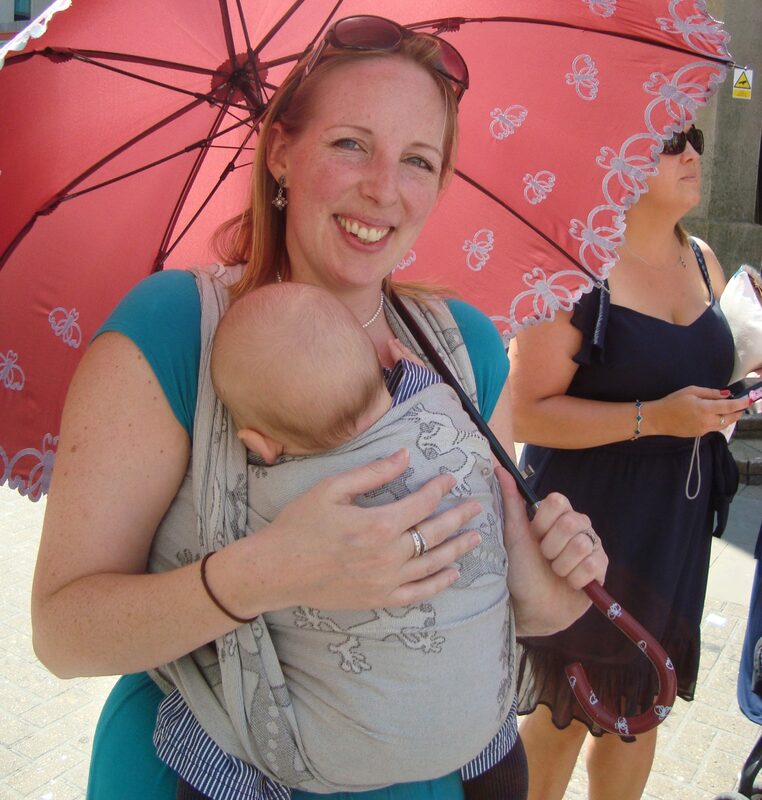 Since August 2012 I have been practicing as a Babywearing Consultant across the South of England, working with both parents and retailers in one-to-one Consultations, training workshops and working on behalf of Manufacturers. I am now one of the UK's most experienced Babywearing Consultants and am regularly invited to be the 'Meet the Expert' speaker at National Baby Shows, talking about all things relating to Babywearing. I have a popular YouTube Channel, with over 50 instructional videos, demonstrating how to use a wide range of baby carriers and slings safely and comfortably. These are added to regularly, providing an excellent resource for people after purchasing their carrier, and as their baby grows, to learn about different carry positions and how to adjust their carrier accordingly. I have also been employed to make videos and write blog posts for manufacturers and major retailers, including BabyBjörn, Izmi Baby and retailer and distributor Slumber Roo (UK distributor for Beco, Boba, Neko and Scootababy). All the carriers I hire out, retail and demo with are certified as 'Hip Healthy' by the International Hip Dysplasia Institute. My Consultancy service covers the Hampshire/West Sussex border area. 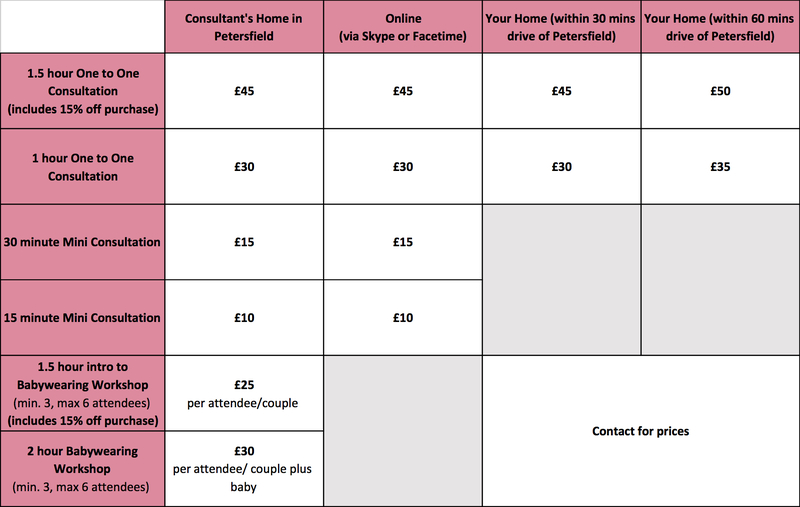 Travel costs up to 30 minutes from my home in Petersfield are included in the Consultation prices. If you are a bit further away please contact me, as I may still be able to come to you (at an additional charge to cover fuel/time costs). I also offer Skype and Facetime Consultations. Not sure which is right for you? Hopefully my table here will help! These are designed for people who know pretty much what they want to hire but want to try a couple of options. These appointments are also ideal if you want a bit of help with an aspect of your carrier (e.g. getting your ring sling comfortable or tightening your stretchy wrap). Skype/Facetime appointments can be used for help with an existing carrier, or for people who aren't in the area but would like to see options before hiring. A follow-up Consultation can be booked for during a hire as well. Payment is required at the time of booking, in order to secure the appointment (this payment is non-refundable and non-transferrable). In-person appointments are available at various times of the day during school hours and weekends, at my home in Petersfield. Skype and Facetime Consultations are available at various times during the daytime and evening. Please get in touch for more details. Held in our Sling Consultation room in Petersfield, or in your own home, for you, plus your partner if they would like to attend. Consultations can be booked during pregnancy or when you already have a child/children. Consultations in your home include travel up to 30 minutes from my home in Petersfield (GU31 4FP). I'm happy to travel further, subject to time availability. Additional travel charges apply (£5 per additional 30 minutes travel each way). Time for you to try slings and baby carriers you are interested in (with the Sling Library demonstration doll and, once you're confident, with your own child if you would like) with help and advice on how to get the most from each carrier. If you already have carriers you'd like help with feel free to bring them along. 15% off a carrier purchase. Held in our Sling Consultation room in Petersfield, or in your own home, for you, plus your partner if they would like to attend. Introduction to Babywearing Workshop - Special Introductory Offer of £25! For 3 to 6 people (plus partners, if they would like to attend). These Workshops are held once a month at my home in Petersfield. They are designed to give a fun, informative overview of the various options for carrying your baby from day one, with the chance to try out a variety of options to see which you like the idea of best. Partners are very welcome to come along at no additional charge. The price includes 15% off a carrier purchase which can either be made at the end of the Workshop or once baby arrives. These workshops are designed for once baby has arrived to allow you to find out which options might suit you best - either from newborn or once baby is a little bit older. If you and a group of friends would like to find out more about baby-carrying you can attend a baby-carrying workshop. This could be with your local parenting group, a group of friends, or maybe your ante-natal class.Workshops can be held at my home in Petersfield or at a venue convenient to you (travel costs included within 30-minute radius). I am happy to organise workshops on other topics, so please get in touch if what you'd like to cover isn't listed above. Please get in touch to discuss available dates and further details. The Follow-up Consultation can be used for any area you like - once your baby has arrived (if the initial consultation was during pregnancy), moving on from newborn carriers, back carrying - anything at all. This does not include a hire as not everyone requires one, but you are welcome to hire something if you wish. The Follow-up Consultation needs to be taken within 9 months of your Newborn Consultation. Not sure what to buy someone for their baby shower/as a newborn present? How about a Baby-Carrying Consultation? All the one-to-one Consultations and packages listed above can be purchased as a Gift Certificate, to be booked in by the recipient at their convenience. A wonderful, enabling gift into the world of Baby-Carrying!